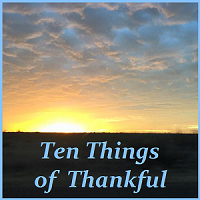 Posted on June 2, 2018 by teachezwell	• This entry was posted in Blogging Challenges and tagged Josie Two Shoes, my sister, Ten things of Thankful, the Wakefield Doctrine. Bookmark the permalink. Good to ‘see’ you again here at the TToT. #3 & 4: you definitely need to follow up so that we can learn the nature of ‘microcredentials‘ love the word, (surely originates in the Land of Extra Credit Questions). or…. or! parenthesiseses…. without those little ‘no-wait!-this-will-make-sense-we-promise’ bits of punctuation, I would totally be out of business. (no, really). the energy thing (in your list) is such a perfect trap for so many. I mean, lacking energy, exactly how is one to muster the…. well, from the sounds of it you have that semi-mystical personal quality, ‘Will’, to not be tied down on the ground permanently. thank you for the kind words, it is this place, this blogosphere, that offers the opportunity for many of those like us to come into contact with others like us. I just can’t be as deep as you but I appreciate your thoughtful comments. You have such an interesting brain!!!! I guess you were born with it, but I’d bet you have cultivated your gifts as well. And it is wonderful to be back online! Such a happy list, and i am so glad you are feeling better! Thank you!! I am really grateful. But as much as I told myself I’d never forget how bad I felt, because I want to stay grateful, the misery of that time has slipped away. I guess that’s a good thing, too. Oh Katharine, thank you and bless you for your sweet birthday post! I LOVE YOU!! (Hey, let’s try that again with more exclamation point enthusiasm): I LOVE YOU!!!!!!!!!!!!!!!!!!!!!!!!!!!!!!!!!!!!!!!!!!!!!!! I love you, sweet one!!!!!!!!!!!!!!!!!!!!!!!!!!!! Congratulations on completing your courses while down for the count! The world would be dull! dull! dull! without exclamations points!! Thanks and thanks!!!!!!!!!! Glad you enjoy exclamation points, too!!! I agree that the parents of children who are in special education classes are “THE best,” and so are the teachers and specialists who tackle the challenges of teaching, calming, encouraging, etc. all those kids. It is not an easy job. I’ve struggled a bit with whether I like the paper version or the online version of scriptures, but have settled into the online version, because I do have the option of highlighting and taking notes in my app, and more importantly am able to enlarge the print. Glad to see you here at TToT. I’m glad you are able to make the online version work. I could also highlight but the feverish searching for a particular scripture just drove me nuts online.